I am participating in a quilt along coming up this month. Here's a peek at some of my blocks. I love snowball blocks. They're super quick and easy to make. You can't go wrong. 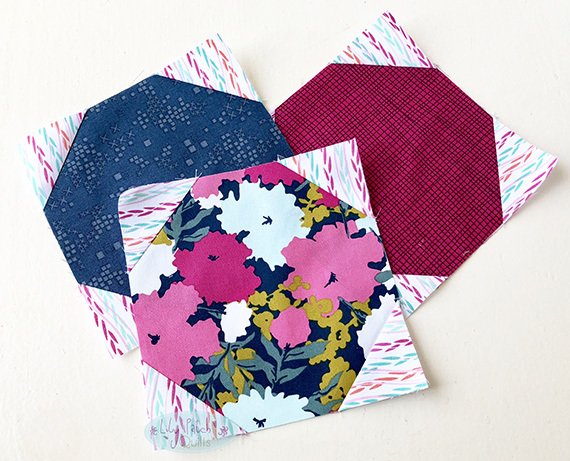 I chose a fabrics from a few different Art Gallery Fabrics fat quarter bundles. These are from the Fusions bundles. I love the vibrant colors and beautiful prints. I'll be sharing another peek before the final reveal. Gorgeous fabrics! That floral is wonderful. And I've never seen the blue with the tiny squares on it. What a super blender! Pretty fabrics. I saw someone using this block as a leader / ender project as she was sewing something else. She had quite a few snowball blocks in a very short period of time. The fabrics are beautiful! I love the ease of snowball blocks, too. Looking forward to seeing your finish!